Stress is another issue, you only have 10 minutes to plan so many people go blank, with practice this can be resolved. Reading news stories and listening to podcasts based on the common IELTS topics is a good way to get ideas (at the end of this post there is a list of those topics). Usually, the most obvious ideas are the best and they don’t have to be really ‘cool’ or ‘high level’. In this post, I will go through some useful technique that I teach my students. 1. 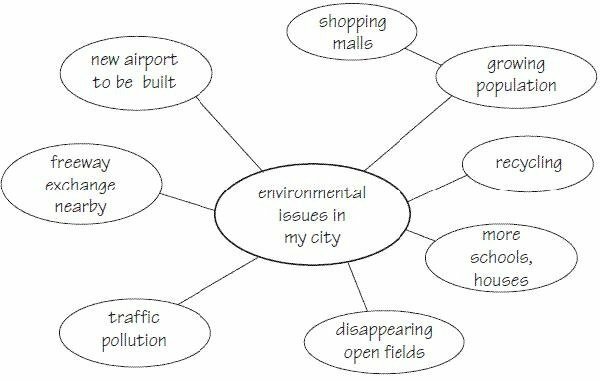 Do not over complicate this, the most obvious ideas are fine in IELTS writing, but they should be specific ideas. You do not need to be an expert on the topic. As long as you can write an idea, explain and develop it with an example then that is enough. 2. Having specific ideas are important. If your ideas are too general you could lose marks in task response, analyse the task question well by picking out the keywords, make sure you understand it then think of ideas directly connected to the task question. 4. Do not panic. Many students while practising can think of ideas easily and can discuss them, however, in the IELTS exam they suddenly go blank and their brain stops working… this is due to stress. You will need to manage your stress levels in the exam otherwise your brain will just melt. 1. Listing advantages and disadvantages or problems and solutions: This idea works well for a problem solution essay or an advantage disadvantage essay but for the other types of essay it might not work very well. You just list problems on the left and solutions on the right, or advantages on the left and disadvantages on the right. Remember though that you should be selective. You should not write a list of ideas in your body paragraph. One central idea is fine. 2. Asking yourself questions: This technique is very useful for getting ideas quickly, imagine talking to a friend and you are discussing the topic, ask lots of questions and keep asking ‘why?’ make notes as ideas come up. 3. Brainstorming: This is when you map out various words and ideas connected to the central topic, the key topic is in a circle and there are various connected circles and ideas. Some students say this works for them but I found that I end up with too many ideas and it takes too long to plan… I don’t really recommend this approach. Here is the question again for the problem solution essay from the last lesson. I have decided to use method number 2 and list problems and possible solutions below. Problem: Over consumption of fast food or ready meals. 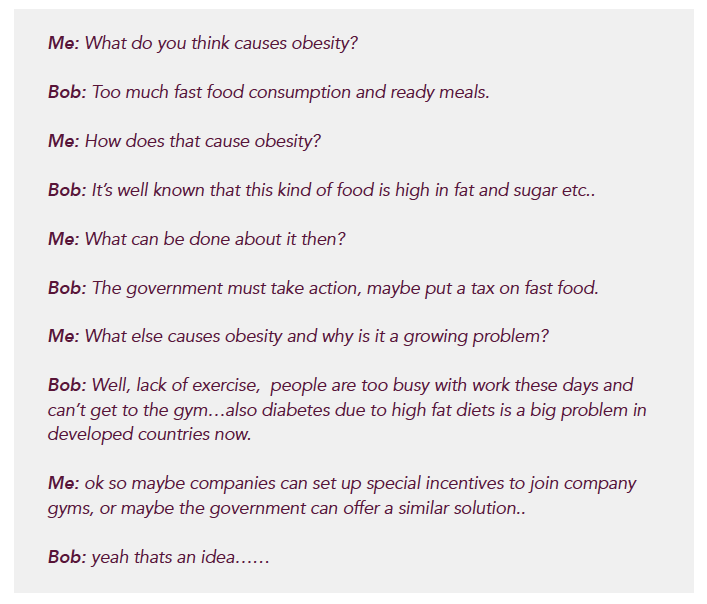 Solution: government should raise tax on fast food. Problem: Too much sugar and trans fats in convenience food. Solution: government regulations needed to stop this. Problem: Lack of exercise due to a busy lifestyle. Solution: special incentives, paid leave once a week to join a sports or fitness club. Problem: Gym membership and sports clubs fees are expensive. Solution: Sports centres need to regulate their prices. Problem: Unhealthy food is cheaper. 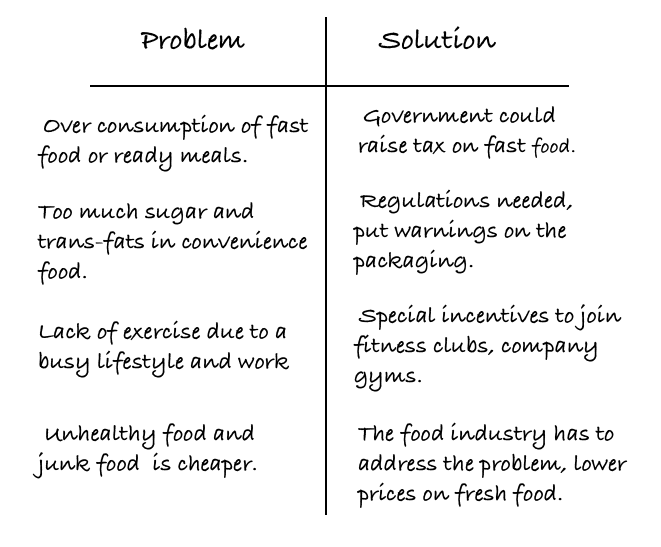 Solution: The food industry has to address the problem. This took me about 3 minutes to list them, now I need to select just one problem and one solution (2 problems and solutions if you feel confident) and write about those. Important: When writing the body paragraphs, do not list problems and solutions, you need to choose just one or two and give examples and explain in more detail… this lesson is just to show how to get ideas quickly. Another way of getting ideas quickly is to ask yourself lots of questions. Here I have chosen method number 3 and wrote notes based on questions I asked myself. exercise…. Explain? because they are busy…. Why? because they have to work. Now you can try… Below is a task question for writing task 2 Problem Solution essay, can you think of ideas using the methods I already outlined? This is just an exercise on getting ideas, we are not going to write the body paragraphs yet. Click below for my ideas.. Here are some ideas I thought of by listing problems and solutions. Problem: Children do not study and play games instead. Solution: Parents need to set rules on studying before playing computer games. Solution: Parents should recognise this issue and restrict access to gaming. Kids are becoming addicted to gaming..why? parents not thinking of consequences.. so what can be done? parents need to limit access to 20 minutes a day….. why? 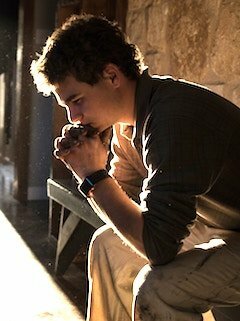 …the kids are not studying and just playing games…so what can be done? parents should set rules, prioritise studying first…. what about violent games? what can be done about them? … gaming companies have to tackle the issue…how? set up age restrictions.. etc.. Some teachers say that you need 2 problems and 2 solutions to get a high band score. There is nothing in the IELTS marking criteria about this, you can actually go with one problem and one solution and still get a Band 7 or more, as long as the essay is well developed. So, as long as your ideas are well explained, on topic, relevant and extended, then you will score higher for task response. Global warming is one of the biggest threats humanity faces in the 21st century and sea levels are continuing to rise at alarming rates. What are the causes of these problems? What are some possible solutions? The first thing that comes to mind about the causes is ‘C02 emissions from privately owned cars and factories’. Now those ideas seem too obvious, so you are probably thinking ‘well that’s what everyone else would say’ so they are not good original ideas. Actually, the examiner doesn’t care, as long as your ideas are on topic and addressing the task question directly it is fine. You will obviously have to develop your ideas and explain them with an example. The example doesn’t have to be true but it must be plausible. Click here to for a lesson on how to write examples. 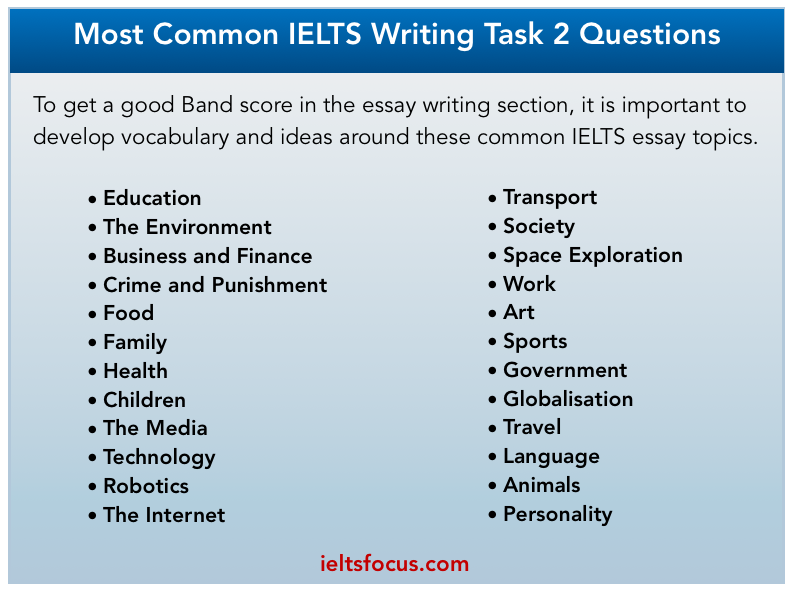 Here are the most common IELTS topics that come up in Writing task 2 and also the Speaking sections. I advise searching news stories and podcasts based on these topics to help you get ideas. Choose one topic a day and read or listen to a story about it.